When Grace Emerson's ex-fiancé starts dating her younger sister, extreme measures are called for. To keep everyone from obsessing about her love life, Grace announces that she's seeing someone. Someone wonderful. Someone handsome. Someone completely made up. Who is this Mr. Right? Someone - exactly unlike her renegade neighbor, Callahan O'Shea. Well, someone with his looks, maybe. His hot body. His knife-sharp sense of humor. His smarts and big heart. Faith Holland left her hometown after being jilted at the altar. Now a little older and wiser, she's ready to return to the Blue Heron Winery, her family's vineyard, to confront the ghosts of her past, and maybe enjoy a glass of red. After all, there's some great scenery there.... Like Levi Cooper, the local police chief - and best friend of her former fiancé. There's a lot about Levi that Faith never noticed, and it's not just those deep green eyes. 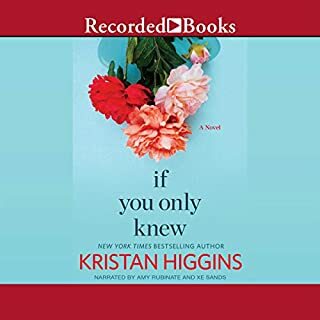 Following in the footsteps of her critically acclaimed novel If You Only Knew, best-selling author Kristan Higgins returns with a pitch-perfect look at the affection - and the acrimony - that binds sisters together. Ainsley O'Leary is so ready to get married - she's even found the engagement ring her boyfriend has stashed away. What she doesn't anticipate is for Eric to blindside her with a tactless breakup he chronicles in a blog - which (of course) goes viral. Devastated and humiliated, Ainsley turns to her half sister, Kate, who's already struggling after the sudden loss of her new husband. Kate has always been so poised, so self-assured, but Nathan's death shatters everything she thought she knew - including her husband - and sometimes the people who step up aren't the ones you expect. With seven years and a murky blended family dynamic between them, Ainsley and Kate have never been overly close, but their shared sorrow dovetails their faltering worlds into one. Despite the lifetime of history between them, the sisters must learn to put their differences aside and open their hearts to the inevitable imperfection of family - and the possibility of one day finding love again. What made the experience of listening to On Second Thought the most enjoyable? the story was so well written, and the narrators only added to the excellence of the writing ... best book I've read in a very long time. What other book might you compare On Second Thought to and why? tho parts of it reminded me of other reads, this book stands on its own .. one of a kind. What does Sands Xe and Amy Rubinate bring to the story that you wouldn’t experience if you just read the book? their voices fit their characters perfectly .. 2 of the very best in the business. it made me laugh, it made me cry, it made me "feel" the characters .. A+. 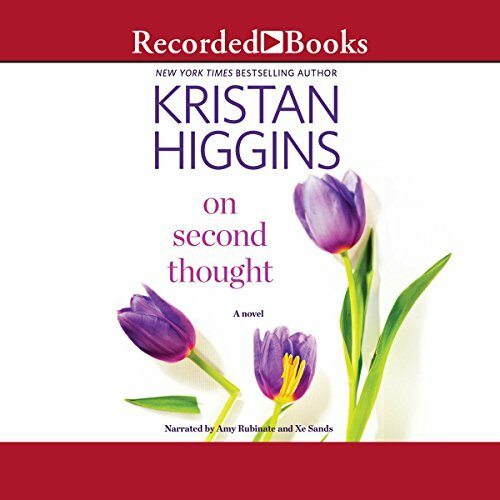 Kristan Higgins has always been among my top 3 authors .. and she is getting better. When I first started listening, it was difficult to listen to Kate. She was totally shattered and in shock. I remember thinking that if she were going to be this way the entire book, I'd have to quit listening right now. Ainsley was the entire opposite. She was happy, bubbly, sweet and very personable. As the story progresses Kate goes through different stages of grief and her character changes. It's a wonderful story with a few surprises here and there. The characters and narration were supberb. I throughly enjoyed this book and will seek other works by Kristen Higgins! Wonderful wonderful book! 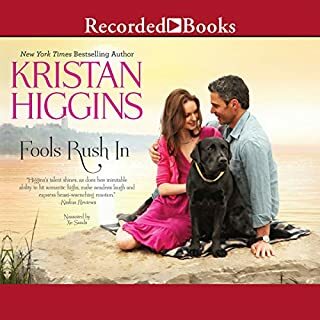 Kristan Higgins knocked it out of the park with this one. Xe Sands and Amy Rubinstein narrated this book beautifully! 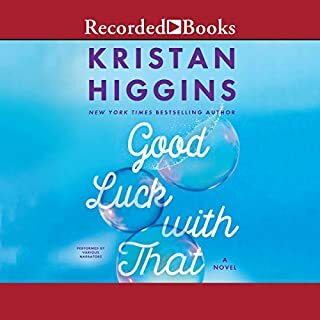 The best Kristan Higgins yet! I started listening to this book on a Friday. I couldn't stop, and binge listened to finish the next day. I've read/listened to every KH book, and this one is her best work yet! I cannot wait for another! Kristan writes, as per usual, with her trademark wit and heart. I am not sorry I went on this journey, but the book might be difficult if you've recently lost a loved one or someone you know is currently suffering with the grief of loss. Ainsley said that movies ought to come with "widow warnings" so I'm adding one to this review. Sometimes, listening to Kate's pain was so real that I almost wanted to skip her chapters. Just before the "excruciating" level could hit, however, Ainsley's chapter would kick in to balance out that grief. Ainsley was an absolute joy, and one of the best characters I've ever read. At one point Kate points out something to the effect that she'd always been kind of dismissive of Ainsley's "bubbly" happiness, not taking her seriously. Until she had to rely on her, she did not realize just how much determined strength it took to remain happy in the face of life's pain, of which Ainsley has had more than her fair share. I loved hating on Eric the Douchebag, and although I despised Madeline the Ex (as I was supposed to), Higgins manages to squeeze a little pity for her out of me. Although, since Madeline would hate being an object of pity, perhaps that is a bit of revenge as well. So, while this was definitely not a beach read, the happiness in it outweighs the pain, the humor was excellent, the romance strong, and I'm glad I listened to every word. Sands Xe and Amy Rubinate were amazing and perfect narrators. If you're on the edge about whether or not to use the credit, go for it. 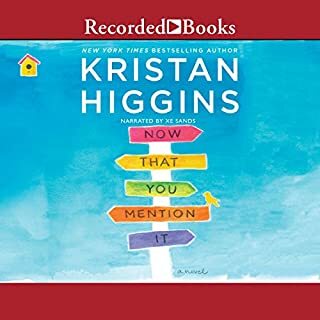 I've listened to many of Kristan Higgins' books, and this was the best yet. Excellent story and performance. Highly recommended. I loved the way this book seemed to form a circle of sorts- bringing a family closer through situations that might have torn others farther apart. There is a lot of grieving in part of the book, but appropriately so. It's not a frivolous quick read... it's a bit more of a drama. I highly recommend the book for having a great story line, "real characters" and a range of human emotion... with a happy ending for most! I was so impressed with the narration of this book as wall as the story line. You won't waste the credit with this one. Kristanna Higgins knocks it out of the park again. With skillful mastery, she takes heartbreak and makes you laugh out loud. The narrators were perfect for the alternating point of view. Cannot recommend highly enough. ... this book is a delightful diversion with beautifully drawn characters and an equally beautiful plot of both grief and love.